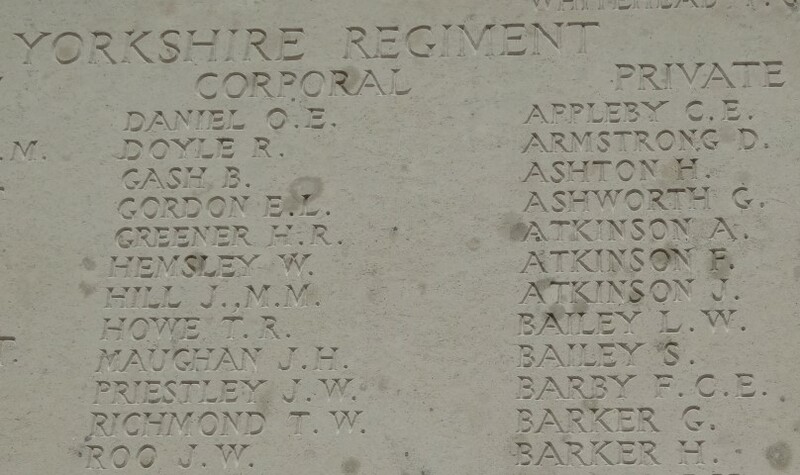 204650 Private F. Atkinson, 10th Battalion, the Yorkshire (Alexandra, Princess of Wales’s Own) Regiment was killed in action 4 October 1917 and is commemorated at the Tyne Cot Memorial. He was 33 years old and is commemorated on the Butterknowle War Memorial and the memorial plaques in St. John the Evangelist Church, Lynesack and Butterknowle Community Centre, previously located within Butterknowle Methodist Church. In 1891, the family lived at 16 Cradock Street, Bishop Auckland and Fred’s father, Trueman worked as a shoemaker. 7 year old Fred was still at school. By 1901 the family lived at Foster Hill in the Parish of Lynesack & Softley where 59 year old Trueman worked as a shoemaker for the Cooperative Society. There was a Branch in Butterknowle. 16 year old Fred worked as an ironmongers’ apprentice at the Cooperative. Fred Atkinson was married to Hilda M. and they had a child. Hilda received 204650 Private Fred Atkinson’s effects. A financial matter was subject to probate. Fred and Mary Hilda Atkinson lived at 6 Folly View, Butterknowle and his effects went to his widow, Mary Hilda. The 1911 census return for Fred Atkinson and his marriage have not been located. The service record of Fred Atkinson has not been traced and the above soldier is the most likely to be the Fred Atkinson commemorated at Butterknowle. 13th, the Northumberland Fusiliers merged into 12th Bn., in August 1917, renamed 12/13th Bn. It was a large operation involving 12 Divisions attacking simultaneously along a 10kms front. In the centre I and II Anzac Corps went forward side by side capturing the village of Broodseinde. The attack was executed in the same manner as Menin Road Ridge (20-25 September) and Polygon Wood (26-27 September). The troops’ objectives were only 1 or 2 kilometres from the start line and the advance was preceded by a massive artillery bombardment. Both sides were planning an attack and when the British bombardment began it caught a number of German units out in the open preparing for their own attack including the 4th Guard and 19th Reserve Divisions. The infantry then followed a creeping barrage which was timed to arrive at the German trenches just before the infantry did. Once again machine-gun emplacement in the form of concrete “pillboxes” delayed but did not stop the advance. The Germans suffered about 10,000 casualties and lost 5,000 men prisoners. The Australians suffered 6,432 casualties, New Zealanders 892 and the British about 300. 1 October: the total strength of the 10/Green Howards was 37 officers and 966 non-commissioned officers and men with a fighting strength of 30 officers and 897 other ranks. To the right of the X Corps was the 37th Division and to the left was the I Australian Corps. The disposition of the X Corps was, from right to left, the 5th Division, the 21st in the centre then the 7th Division facing Polderhoek, Reutel and Noordhemhoek respectively. At midnight, 3 October, D Company reached Clapham Junction, B, C and A Companies followed. The front line companies, B and D went forward to Glencorse Wood where they came under a very heavy artillery barrage and as a result lost touch with 12/13th Northumberland Fusiliers. A and C Companies followed and were met with the same heavy fire. The whole of 10/Green Howards were near Black Watch Corner under heavy shell fire but reached their “jumping off” place by 5.15am. Zero hour was 6.00am. As a consequence of 1/Lincolns not being in their correct position due to the bombardment, 10/Green Howards became the reserve battalion and held a line to the front of Polygon Wood. The Germans put down another intense barrage at zero hour. The battalion had been under shell fire from 9pm on the 3rd to 6am on the 4th and had suffered serious losses. In the evening, a move forward was made to a position near the old front line in Juniper Trench. Consolidation was put in hand. For the whole of the 5th 6th and 7th October, the battalion held the position under severe artillery fire and both the 62nd and 64th Brigades suffered many casualties. Just before midnight 7 October, the battalion was relieved and moved back to Zillebeke Lake. 1 officer and 74 other ranks were killed, while 10 officers and 249 NCOs and men were wounded. 204650 Private F. Atkinson was awarded the British War and Victory medals. 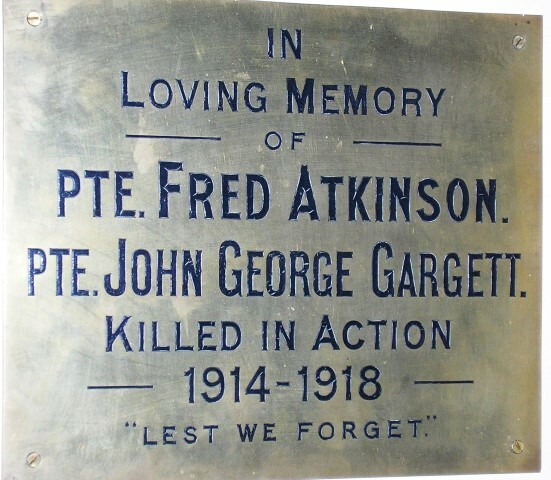 Private F. Atkinson is also commemorated on the Butterknowle War Memorial and the memorial plaques located in St. John the Evangelist Church, Lynesack and the Butterknowle Village Hall, previously in the Butterknowle Methodist Church. 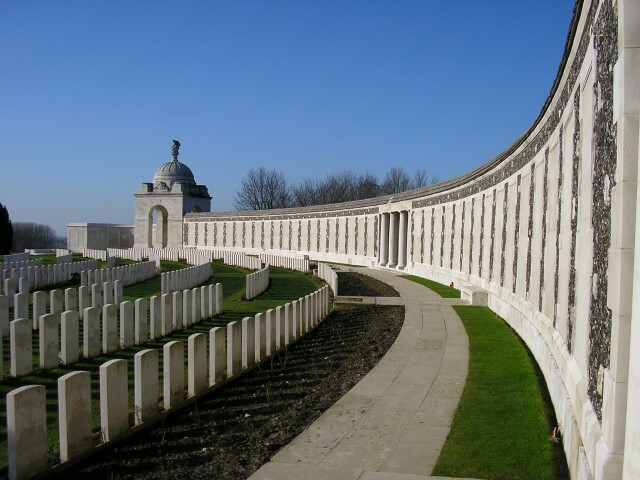 “Roll of Honour: In Memoriam: Atkinson; in memory of my dear husband Pte. F. Atkinson who was killed in action on October 4th 1917, ever remembered by his loving wife and son. Soldiers Died in the Great War record that 204650 Private F. Atkinson was born at Shildon and resided at Butterknowle. Note: The Green Howards Museum at Richmond, North Yorkshire should be contacted to examine any records held by the museum.